Just when we thought bollards on bike paths were on a road to extinction they have come roaring back, as hazardous as ever. The latest sighting of the discredited technology is on the path adjacent to the West Coast Highway in Trigg, north of Perth in WA. And there is something quite special about this re-emergence of the species: whereas as bollards were once intended to stop motor vehicles entering a path, here they are intended to deliberately hinder the bikes travelling along the path. The claim is that bikes were travelling too fast along the shared path and and were a risk to pedestrians. The solution was to implant hazardous bollards so that bike riders, fearing the consequence of striking the objects, might ride more slowly. The claim is spurious; the solution is injurious. Before the conversation goes any further, these bollards must come out. Now. There is no engineering justification for this installation. There is no guideline of standard that would support an installation of this kind for the purposes of slowing riders down. Should there be an incident, and the City of Sterling finds itself in court, it would not have so much as a fig leaf to cover itself with. So get them out immediately. Then we can deal with the perception that riders are speeding. The Perth path network has speed measuring devices placed at regular intervals. The average speeds of bikes in this sector appear to be comparatively low. Maybe there are other concerns? Let’s get the evidence before some sensible people and have a good look at it. If there is a problem with collisions and conflict with walkers and runners, we should be able to find a solution that does not beak the leg of someone on a bike. Ideally, pedestrians and bikes could be separated: the cross section of the road is certainly wide enough to accommodate such a solution. Aside from the many residents who are upset by the mere eyesore of the installment, a volunteer service that offers trishaw rides to elderly and less able-bodied passengers has been forced to abandon operators in the area. 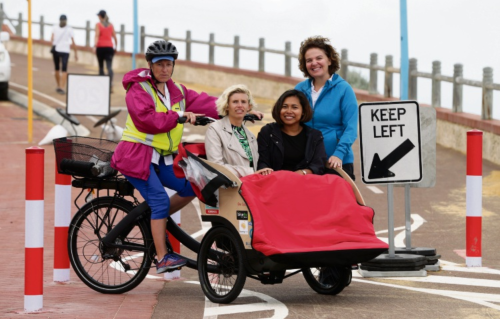 Alanagh Godderidge, who facilities the volunteer service called Cycling Without Age, is unable to fit between the bollards on the path and says that the alternate route through the road-side gap is too dangerous to navigate with her passengers. 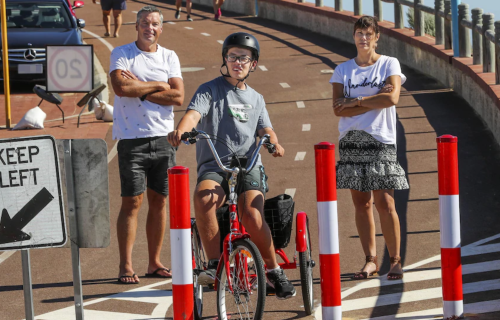 Former Olympic swimmer Deane Pieters has also heavily criticised the council’s approach to slowing cyclists, which his disabled son Ben cannot navigate on his tricycle without assistance. “It is absolutely ridiculous what they’ve come up with in terms of design,” said Mr Pieters. The council’s manager of engineering design, Paul Giamov, said the bollards have been installed to “address ongoing concerns of the potential risk and injury caused by fast moving cyclists”. Concerns flared immediately on social media from residents and path users claiming that these bollards will pose higher risk of accident for those trying to navigate the obstacles, and will ultimately do little to reduce speeds before or after the dangerous bottleneck. Mr Irwin acknowledges that while they may not the prettiest or best solution, “the one thing we know is bollards work”. Do they really Mr Irwin? Clearly the current solution is not working at all for some and presents serious concerns for many others. If you have any ideas to help the City of Stirling come up with a more appropriate way to promote safety for all path users, we implore you to send Mayor Irwin your thoughts at Mark.Irwin@stirling.wa.gov.au.